What are falsified medicines and why are they a problem in the EU? Falsified Medicines are fake medicines that pass as real, authorised medicines. Falsified medicines may contain ingredients, including active ingredients, which are of low quality or in the wrong dosage – either too high or too low. Since they have not passed through the necessary quality, safety and efficacy evaluation as required by the EU authorisation procedure, they can be a major health threat. Do we know how many falsified medicines are on the EU market? Since falsified medicines cannot be completely traced it is difficult to obtain exact figures. The WHO estimates that 1 in 10 medicines in low and middle-income countries are falsified. The overall proportion of falsified medicines is thought to be much lower in the EU. The Commission received 400 notifications of falsified medicines between 2013 and 2017. These notifications are based on investigations carried out by national authorities. Interpol, Europol and national medicines agencies seize many falsified medicines and close hundreds of illegal websites every year. In 2017, counterfeit medicines of a value of nearly €7 million were seized at the EU borders. What has been done at EU level to prevent falsified medicines from reaching patients? In 2011, the EU adopted the Falsified Medicines Directive introducing harmonised, pan-European safety and control measures that allow easier identification of falsified medicines, and improve verifications and controls at borders and within the EU. These measures include: safety features on prescription medicines, an EU logo to identify legal online pharmacies, tougher rules on the importation of active ingredients and strengthened record keeping for wholesalers. A key measure of the Directive is the introduction of mandatory safety features on the outer packaging of prescription medicines and a medicines authentication system. What are the ‘safety features'? They will be required on most prescription medicines and some over-the-counter medicines in the EU. These new safety features must be placed on the packaging of medicines to be sold on the EU market after 9 February 2019. How will it look like? 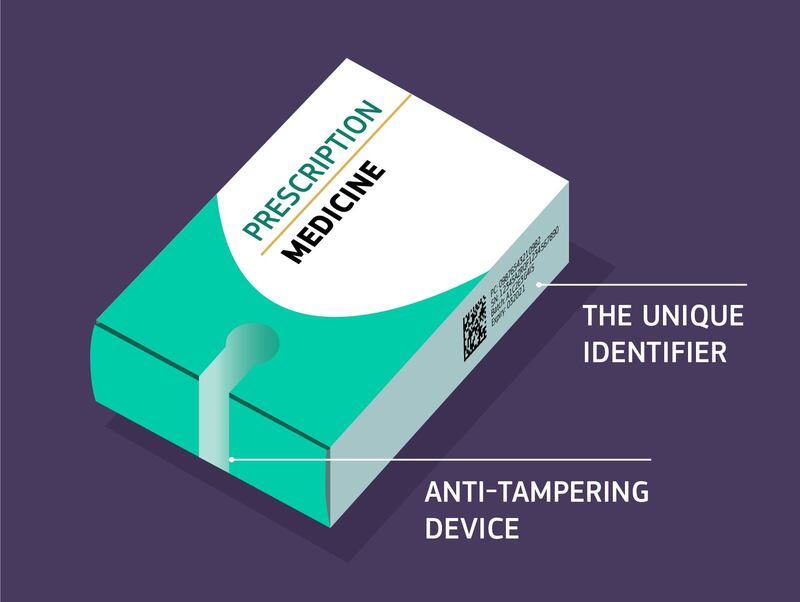 How does the EU medicines authentication system work? The medicines authentication system introduces end-to-end verification of prescription medicines sold in the EU. As a first step, manufacturers will upload the information contained in the unique identifier for each individual medicine to the central EU repository run by the European Medicines Verification Organisation, a non-profit legal entity set up by the EU pharmaceutical industry. Depending on their source, wholesalers will also need to scan medicines at different points in the supply chain to verify their authenticity. Finally, pharmacies and hospitals will scan each medicine at the end of the supply chain to verify their authenticity and check them out from the repository before dispensing them to patients. Will a patient be able check the authenticity of medicines online or via an app on her/his smartphone? The system requires pharmacists – and hospitals - to verify the authenticity of products before they are supplied to patients. Since the system is closed, only authorised persons will be able to access the information in the repository. To identify a legal online pharmacy, citizens must click on the European logo on the pharmacy webpage to make sure it is on the list of legal online pharmacies in the relevant Member State. Only pharmacies authorised in an EU country can sell medicines to European patients online. Who will benefit from the new safety features? The safety features allow better tracking of the prescription medicines dispensed in pharmacies, hospital pharmacies and legal online pharmacies. First and foremost, patients will benefit from the additional checks enabling to ensure that the medicines they receive are authentic and safe. Actors in the pharmaceutical sector will also benefit from being able to check that the medicines they buy and sell are authentic and have not been tampered with. Finally, Member States' authorities will have an additional tool when investigating potential incidents of falsification and will be able to trace individual medicinal products in the EU. When will the new rules come into effect? The safety features and authentication will be required for medicines produced after 9 February 2019, except in Greece and Italy. The changes will not be immediately visible, since companies can continue to sell products in stock. This is why, in the beginning, packs with and without the 2D barcode in pharmacies will still be available. Some prescription medicines, such as medicinal gases, are exempted from the safety features due to their low risk from falsification. Over the counter medicines may be covered by the new rules if they are found to be at high risk of falsification, such as omeprazole. When the legislation was adopted both Member States decided to defer the rules for an additional six years because they already had similar systems in place.